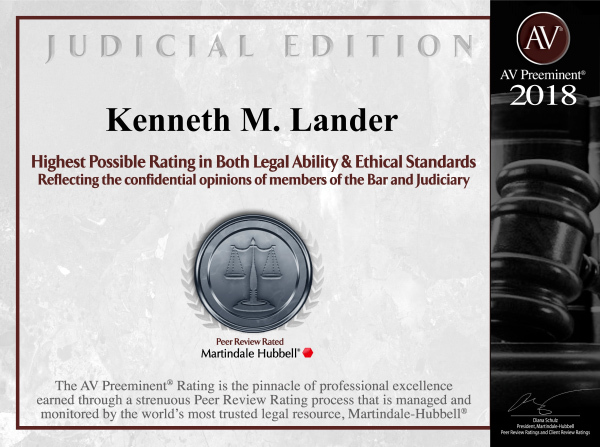 All three principal attorneys at Kortenhof McGlynn & Burns LLC have an AV® PreeminentSM Peer Review Rating ™ from Martindale-Hubbell®. We have over 90 years of combined experience as successful lawyers in the defense of civil litigation. Ken was first licensed in Missouri in 1982 and started at the insurance defense firm of Kortenhof & Ely back in April 1984. He has been AV rated by Martindale-Hubbell since May 1997. He has appeared before the Missouri Supreme Court, Missouri Court of Appeals Eastern and Western Districts, the 7th and 8th Circuits of the United States Court of Appeals, the United States District Court – Eastern District of Missouri, and the United States District Court – Southern District of Illinois. He has practiced insurance defense litigation for over 32 years and has had over 60 trials. He has obtained defense verdicts in serious medical negligence cases and has tried numerous automobile accident cases to conclusion, as well as cases involving premises liability, civil rights/excessive force, insurance contracts and property damage.